Dead soldiers and destroyed tanks from the Japanese 17th Army lie at the mouth of the Matanikau River after a failed assault on U.S. Marine positions on October 23 – 24, 1942. The Battle for Henderson Field, also known as the Battle of Henderson Field or Lunga Point by the Japanese, took place October 23 – October 26, 1942 on and around Guadalcanal in the Solomon Islands. The battle was a land, sea, and air battle of the Pacific campaign of World War II and was fought between the Imperial Japanese Army and Navy and Allied (mainly United States (U.S.) Marine and U.S. Army) forces. The battle was the third of the three major land offensives conducted by the Japanese during the Guadalcanal campaign. The U.S. forces were defending the Lunga perimeter, which guarded Henderson Field on Guadalcanal, that had been captured from the Japanese by the Allies in landings on Guadalcanal on August 7, 1942. Hyakutake's soldiers conducted numerous assaults over three days at various locations around the Lunga perimeter, but all were repulsed with heavy losses for the Japanese attackers. At the same time, Allied aircraft operating from Henderson Field successfully defended U.S. positions on Guadalcanal from attacks by Japanese naval air and sea forces. The battle was the last serious ground offensive conducted by Japanese forces on Guadalcanal. After an attempt to deliver further reinforcements failed during the Naval Battle of Guadalcanal in November 1942, Japan conceded defeat in the struggle for the island and successfully evacuated many of its remaining forces by the first week of February 1943. The Guadalcanal campaign was pivotal in the Pacific theater of operations. It marked the end of Japanese expansion and dominion, and turned the tide toward Allied victory – and ultimately a victory for democracy. Tulagi – Savo I. – Tenaru – Eastern Solomons – Edson's Ridge – Matanikau – Cape Esperance – Henderson Field – Santa Cruz Is. – Carlson's patrol – Naval Guadalcanal – Tassafaronga – Ke – Rennell I. 1st Tulagi – Guadalcanal – Blackett Strait – Cartwheel – Death of Yamamoto – New Georgia – Kula Gulf – Kolombangara – Vella Gulf – Horaniu – Vella Lavella – Naval Vella Lavella – Treasury Is. – Choiseul – Bougainville – Rabaul air raids – Cape St. George – Green Is. Taking the Japanese by surprise, by nightfall on August 8, the 11,000 Allied troops, under the command of Lieutenant General Alexander Vandegrift and mainly consisting of United States Marine Corps units, had secured Tulagi and nearby small islands, as well as an airfield under construction at Lunga Point on Guadalcanal. 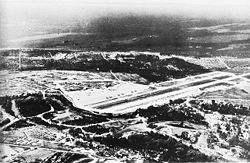 The airfield was later named Henderson Field by Allied forces. The Allied aircraft that subsequently operated out of the airfield became known as the "Cactus Air Force" (CAF) after the Allied codename for Guadalcanal. To protect the airfield, the U.S. Marines established a perimeter defense around Lunga Point. In response to the Allied landings on Guadalcanal, the Japanese Imperial General Headquarters assigned the Imperial Japanese Army's 17th Army, a corps-sized command based at Rabaul and under the command of Lieutenant-General Harukichi Hyakutake, with the task of retaking Guadalcanal from Allied forces. Beginning August 19, various units of the 17th Army began to arrive on Guadalcanal with the goal of driving Allied forces from the island. Because of the threat by CAF aircraft based at Henderson Field, the Japanese were unable to use large, slow transport ships to deliver troops and supplies to the island. Instead, the Japanese used warships based at Rabaul and the Shortland Islands to carry their forces to Guadalcanal. The Japanese warships, mainly light cruisers or destroyers from the Eighth Fleet under the command of Vice Admiral Gunichi Mikawa, were usually able to make the round trip down "The Slot" to Guadalcanal and back in a single night, thereby minimizing their exposure to CAF air attack. Delivering the troops in this manner, however, prevented most of the soldiers' heavy equipment and supplies, such as heavy artillery, vehicles, and much food and ammunition, from being carried to Guadalcanal with them. These high speed warship runs to Guadalcanal occurred throughout the campaign and were later called the "Tokyo Express" by Allied forces and "Rat Transportation" by the Japanese. The first Japanese attempt to recapture Henderson Field failed when a 917-man force was defeated on August 21 in the Battle of the Tenaru. The next attempt took place from September 12 through September 14, with the 6,000 soldiers under the command of Major General Kiyotake Kawaguchi being defeated in the Battle of Edson's Ridge. After their defeat at Edson's Ridge, Kawaguchi and the surviving Japanese troops regrouped west of the Matanikau River on Guadalcanal. Hyakutake immediately began to prepare for another attempt to recapture Henderson Field. The Japanese navy promised to support Hyakutake's next offensive by delivering the necessary troops, equipment, and supplies to the island, and by stepping-up air attacks on Henderson Field and sending warships to bombard the airfield. As the Japanese regrouped, the U.S. forces concentrated on shoring up and strengthening their Lunga defenses. On September 18, an Allied naval convoy delivered 4,157 men from the U.S. 7th Marine Regiment to Guadalcanal. This regiment had previously formed part of the 3rd Provisional Marine Brigade and was fresh from garrison duty in Samoa. These reinforcements allowed Vandegrift, beginning on September 19, to establish an unbroken line of defense completely around the Lunga perimeter. General Vandegrift and his staff were aware that Kawaguchi's troops had retreated to the area west of the Matanikau and that numerous groups of Japanese stragglers were scattered throughout the area between the Lunga Perimeter and the Matanikau River. Vandegrift, therefore, decided to conduct a series of small unit operations around the Matanikau Valley. The first U.S. Marine operation against Japanese forces west of the Matanikau, conducted between September 23 and September 27 1942 by elements of three U.S. Marine battalions, was repulsed by Kawaguchi's troops under Colonel Akinosuke Oka's local command. In the second action, between October 6 and October 9, a larger force of U.S. Marines successfully crossed the Matanikau River, attacked newly landed Japanese forces from the 2nd (Sendai) Infantry Division under the command of generals Masao Maruyama and Yumio Nasu and almost completely destroyed the Japanese 4th Infantry Regiment. The second action forced the Japanese to retreat from their positions east of the Matanikau. In the meantime, Major General Millard F. Harmon, commander of United States Army forces in the South Pacific, convinced Vice Admiral Robert L. Ghormley, commander of Allied forces in the South Pacific Area, that U.S. Marine forces on Guadalcanal needed to be reinforced immediately if the Allies were to successfully defend the island from the next expected Japanese offensive. Thus on October 13, a naval convoy delivered the 2,837-strong 164th U.S. Infantry Regiment, a North Dakota Army National Guard formation from the U.S. Army's Americal Division, to Guadalcanal. Mikawa's ships continued nocturnal deliveries of men and materiel to Guadalcanal. Between October 1 and October 17 Japanese convoys delivered 15,000 Japanese troops, comprising the remainder of the 2nd Infantry Division and one regiment of the 38th Infantry Division, plus artillery, tanks, ammunition, and provisions, to Guadalcanal. One of these, on October 9, landed General Hyakutake on the island to personally lead the Japanese forces in the planned offensive. Mikawa also sent heavy cruisers on several occasions to bombard Henderson Field. One of these bombardment missions on the night of October 11 was intercepted by U.S. naval forces and defeated in the Battle of Cape Esperance. On October 13, in order to help protect the transit of an important supply convoy to Guadalcanal that consisted of six slower cargo ships, the Japanese Combined Fleet commander Isoroku Yamamoto sent a naval force from Truk, commanded by Takeo Kurita, to bombard Henderson Field. Kurita's force, consisting of the battleships Kongō and Haruna, escorted by one light cruiser and nine destroyers, approached Guadalcanal unopposed and opened fire on Henderson Field at 01:33 on October 14. Over the next one hour and 23 minutes, they fired 973 14-inch (355mm) shells into the Lunga perimeter, most of them falling in and around the 2,200-meter-square area of the airfield. The bombardment heavily damaged the airfield's two runways, burned almost all of the available aviation fuel, destroyed 48 of the CAF's 90 aircraft, and killed 41 men, including six CAF aircrew. Despite the heavy damage, Henderson personnel were able to restore one of the runways to operational condition within a few hours. Over the next several weeks, the CAF gradually recovered as Allied forces delivered more aircraft, fuel, and aircrew personnel to Guadalcanal. Observing the Japanese deliveries of troops and supplies to the island, American forces were expecting an imminent offensive by Japanese ground forces, but they were not sure where and when it would take place. Because of the loss of their positions on the east side of the Matanikau, the Japanese decided that an attack on the U.S. defenses along the coast would be prohibitively difficult. Thus, after observation of the American defenses around Lunga Point by his staff officers, Hyakutake decided that the main thrust of his planned attack would be from south of Henderson Field. His 2nd Division (augmented by troops from the 38th Division), under Lieutenant General Masao Maruyama and comprising 7,000 soldiers in three infantry regiments of three battalions each was ordered to march through the jungle and attack the American defenses from the south near the east bank of the Lunga River. The 2nd Division was split into three units; the Left Wing Unit under Major General Yumio Nasu containing the 29th Infantry Regiment, the Right Wing Unit under Major General Kiyotake Kawaguchi consisting of the 230th Infantry Regiment (from the 38th Infantry Division), and the division reserve led by Maruyama comprising the 16th Infantry Regiment. The date of the attack was set for October 22. To distract the Americans from the planned attack from the south, Hyakutake's heavy artillery plus five battalions of infantry (about 2900 men) under Major General Tadashi Sumiyoshi were to attack the American defenses from the west along the coastal corridor. The Japanese estimated that there were 10,000 American troops on the island, when in fact there were about 23,000. At this time, the Lunga perimeter was defended by four American regiments comprising 13 infantry battalions. The 164th Infantry Regiment guarded the easternmost sector. Extending from the 164th south and west across Edson's Ridge to the Lunga River was the 7th Marine Regiment. Covering the sector west of the Lunga to the coast were the 1st and 5th Marine Regiments. Defending the mouth of the Matanikau for the Americans were two battalions under the command of Lieutenant Colonel William J. McKelvy: the 3d Battalion, 1st Marines, and the 3d Battalion, 7th Marines. McKelvy's force was separated from the Lunga perimeter by a gap that was covered by patrols. The U.S. Lunga perimeter around Henderson Field in late September 1942 before the arrival of the U.S. 164th Infantry Regiment. The Lunga River runs through the center of the map. The Matanikau River is off the map to the left. On October 12, a company of Japanese engineers began to break a trail, called the "Maruyama Road," from the Matanikau towards the southern portion of the U.S. Lunga perimeter. The trail traversed some 15 miles (24 km) of the most difficult terrain on Guadalcanal, including numerous rivers and streams, deep, muddy ravines, steep ridges, and dense jungle. Between October 16 and October 18, the 2nd Division began their march along the Maruyama Road, led by Nasu's unit and followed in order by Kawaguchi and Maruyama. Each soldier had been ordered to carry one artillery shell plus his pack and rifle. Early on the morning of October 20, Maruyama reached the Lunga River. Believing that his units were about 4 miles (6 km) south of the airfield, he ordered the left and right wing units to advance abreast of each other parallel to the Lunga north towards the American lines and set the time of the attack for 18:00 on October 22. Maruyama, however, was mistaken. He and his troops were actually 8 miles (13 km) south of the airfield. By the evening of October 21, it was clear to Maruyama that his units would not be in position to attack the next day, so he postponed the attack to October 23 and put his men on half rations to conserve their dwindling food supply. At nightfall on October 22, much of the 2nd Division still remained strung out along the Murayama Road, but Maruyama ruled out any postponement of the attack. During this time Sumiyoshi prepared his command to attack the American forces from the west. On October 18, he began shelling Henderson Field with 15 150 mm howitzers. What remained of the 4th Infantry Regiment under Colonel Nomasu Nakaguma began to gather openly near Point Cruz (on the coast just west of the Matanikau). On October 19 Colonel Akinosuka Oka led the 1200 troops of his 124th Infantry Regiment inland across the Matanikau and began moving up the east bank towards high ground east of the river. On October 23, Maruyama's forces struggled through the jungle to reach the American lines. Kawaguchi, on his own initiative, began to shift his right wing unit to the east, believing that the American defenses were weaker in that area. Maruyama, through one of his staff officers, ordered Kawaguchi to keep to the original attack plan. When he refused, Kawaguchi was relieved of command and replaced by Colonel Toshinari Shoji, commander of the 230th Infantry Regiment. That evening, after learning that the left and right wing forces were still struggling to reach the American lines, Hyakutake postponed the attack to 19:00 on October 24. The Americans remained completely unaware of the approach of Maruyama's forces. On this day the Japanese 11th Air Fleet under Jinichi Kusaka based at Rabaul sent 16 bombers and 28 zero fighters to attack Henderson Field. In response, 24 Wildcats and four P-39s from the CAF rose to meet them, resulting in "one of the biggest dogfights ever fought over Guadalcanal." The Japanese appeared to lose several aircraft in the day's engagements, but their actual losses are unknown. The CAF lost one Wildcat to battle damage but the pilot was uninjured. Sumiyoshi was informed by Hyakutake's staff of the postponement of the offensive to October 24, but was unable to contact Nakaguma to inform him of the delay. Thus, at dusk on October 23, two battalions of Nakaguma's 4th Infantry Regiment and the nine tanks of the 1st Independent Tank Company launched attacks on the U.S. Marine defenses at the mouth of the Matanikau. Nakaguma's tanks attacked in pairs across the sandbar at the mouth of the Matanikau behind a barrage of artillery. Marine 37 mm anti-tank guns and artillery quickly destroyed all nine tanks. At the same time, four battalions of Marine artillery, totaling 40 howitzers, fired over 6,000 rounds into the area between Point Cruz and the Matanikau, causing heavy casualties in Nakaguma's infantry battalions as they tried to approach the Marine lines. Nakaguma's attacks ended by 01:15 on October 24, inflicting only light casualties on the Marines and gaining no ground. 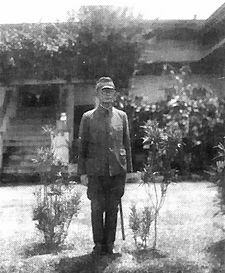 Partly in response to Nakaguma's attacks, on October 24 the 2nd Battalion, 7th Marines under Lieutenant Colonel Herman H. Hanneken deployed to the Matanikau. After Oka's forces were sighted approaching the Marine Matanikau positions from the south, Hanneken's battalion was placed on a ridge facing south which formed a continuous extension of the inland flank of the Marine's horseshoe-shaped Matanikau defenses. A gap, however, still remained between Hanneken's left (east) flank and the main perimeter. With the redeployment of Hanneken's battalion, the 700 troops of 1st Battalion, 7th Marines under Lieutenant Colonel Chesty Puller were left alone to hold the entire 2,500 yards (2,286 m) line on the southern face of the Lunga perimeter east of the Lunga River. Late on October 24, Marine patrols detected Maruyama's approaching forces, but it was now too late in the day for the Marines to rearrange their dispositions. At 14:00 on October 24, Maruyama's left and right wing units began to deploy for their attacks. Maruyama's troops had very little artillery or mortar support for their upcoming assault, having abandoned most of their heavy cannons along the Maruyama Road. Between 16:00 and 21:00, heavy rain fell, delaying the Japanese approach and causing "chaos" in the Japanese formations, already exhausted from the long march through the jungle. Shoji's right wing force accidentally turned parallel to the Marine lines, and all but one battalion failed to make contact with the Marine defenses. Shoji's 1st Battalion, 230th Infantry Regiment "stumbled" into Puller's lines about 22:00 and were driven off by Puller's men. For unknown reasons, Maruyama's staff then reported to Hyakutake that Shoji's men had overrun Henderson Field. At 00:50 on October 25, Hyakutake signaled Rabaul that, "A little before 23:00 the Right Wing captured the airfield." At about this time, Nasu's left wing battalions finally began to reach the Marine defenses. At 00:30 on October 25, the 11th Company of Nasu's 3rd Battalion under Captain Jiro Katsumata found and attacked Company A of Puller's battalion. Katsumata's attack was impeded by heavy barbed wire placed in front of the Marine line and then hit heavily by American machine gun, mortar, and artillery fire. By 01:00, the Marine fire had killed most of Katsumata's company. Further west, the 9th Company of Nasu's 3rd Battalion charged straight into Puller's Company C at 01:15. Within five minutes, a Marine machine gun section led by Sergeant John Basilone killed almost every member of the 9th Company. By 01:25 heavy fire from the Marine divisional artillery was falling into Nasu's troop assembly and approach routes, causing heavy casualties. Recognizing that a major Japanese attack was underway, Puller requested reinforcement. At 03:45, the 3rd Battalion, 164th Infantry, commanded by Lieutenant Colonel Robert Hall and being held in reserve, was fed piecemeal into Puller's line. In spite of the darkness and intermittent heavy rain, the Army National Guard troops were successfully placed in Puller's defenses before daybreak. Just before dawn, Colonel Masajiro Furimiya, the commander of the 29th Infantry, with two companies from his 3rd Battalion plus his headquarters staff was able to penetrate the Marine artillery fire and reach Puller's lines about 03:30. Most of Furimiya's troops were killed during their assault, but about 100 broke through the American defenses and carved a salient 150 yards (137 m) in width and 100 yards (91 m) deep in the center of Puller's line. After sunrise, Furimiya's 2nd Battalion joined in the assault on Puller, but were thrown back. At 07:30, Nasu decided to withdraw most of the remainder of his troops back into the jungle and prepare for another attack that night. During the day of October 25, Puller's men attacked and eradicated the salient in their lines and hunted small groups of Japanese infiltrators, killing 104 Japanese soldiers. More than 300 of Maruyama's men in total were killed in their first attacks on the Lunga perimeter. At 04:30, Hyakutake rescinded the message announcing the capture of the airfield, but at 07:00 declared that the results of Maruyama's attack were unknown. The Japanese 8th Fleet had task units ready to support the Army's attacks on Guadalcanal. Upon receipt of Hyakutake's message declaring success at 00:50 on October 24, the task units went into action. The light cruiser Sendai and three destroyers patrolled west of Guadalcanal to interdict any Allied ships that tried to approach the island. A First Assault Unit with three destroyers and a Second Assault Unit with the light cruiser Yura and five destroyers approached Guadalcanal to attack any Allied ships off the island's north or east coast and to provide gunfire support for Hyakutake's forces. At 10:14, the First Assault Unit arrived off Lunga Point and chased away two old U.S. destroyers converted to minesweepers, Zane and USS Trevor, which were delivering aviation fuel to Henderson Field. The Japanese destroyers then sighted and sank the U.S. tugboat Seminole and patrol boat YP-284 before beginning their bombardment of the U.S. positions around Lunga Point. At 10:53, a Marine shore gun hit and damaged one of the destroyers, Akatsuki and all three Japanese destroyers withdrew while being strafed by four CAF Wildcat fighters. As the Second Assault Unit approached Guadalcanal through Indispensable Strait, it was attacked by five CAF SBD Dauntless (SBD) dive bombers. Bomb hits caused heavy damage to Yura, and the unit reversed course to try to escape. More CAF air attacks on Yura throughout the day caused further damage, and the cruiser was abandoned and scuttled at 21:00 that night. Meanwhile, 82 Japanese bombers and fighters from the 11th Air Fleet and from the aircraft carriers Junyō and Hiyō attacked Henderson Field in six waves throughout the day and were engaged by CAF fighters and Marine anti-aircraft guns. By the end of the day the Japanese had lost 11 fighters, 2 bombers, and one reconnaissance aircraft along with most of the aircrews in the downed aircraft. Two CAF fighters were destroyed in the day's fighting but both pilots survived. The Japanese air attacks caused only light damage to Henderson Field and the American defenses. The Americans later referred to this day as "Dugout Sunday" because the continuous Japanese air, naval, and artillery attacks kept many of the Lunga defenders in their foxholes and shelters throughout the day. Throughout the day of October 25, the Americans redeployed and improved their defenses against the Japanese attack they were expecting that night. In the west, Hanneken and the 5th Marines closed the gap between their two forces. Along the southern portion of the perimeter, Puller's and Hall's troops disengaged and repositioned. Puller's men fortified the western 1,400 yards (1,280 m) of the sector and the 164th soldiers took the eastern 1,100 yards (1,006 m) segment. The division reserve, the 3rd Battalion, 2nd Marine Regiment was placed directly behind Hall's and Puller's positions. Maruyama committed his reserve force, the 16th Infantry Regiment, to Nasu's left wing unit. Beginning at 20:00 on October 25 and extending into the early morning hours of October 26 the 16th and what remained of Nasu's other units conducted numerous, unsuccessful frontal assaults on Puller's and Hall's lines. U.S. Marine and Army rifle, machine gun, mortar, artillery and direct canister fire from 37 mm anti-tank guns "wrought terrible carnage" on Nasu's men. Colonel Toshiro Hiroyasu, the commander of the 16th, and most of his staff as well as four Japanese battalion commanders were killed in the assaults. Nasu was hit by rifle fire and mortally wounded, dying a few hours later. A few small groups of Nasu's men broke through the American defenses, including one led by Colonel Furimiya, but were all hunted down and killed over the next several days. Shoji's right wing units did not participate in the attacks, choosing instead to remain in place to cover Nasu's right flank against a possible attack in that area by U.S. forces that never materialized. At 03:00 on October 26, Oka's unit finally reached and attacked the Marine defenses near the Matanikau. Oka's troops assaulted all along an east-west saddle ridge held by Hanneken's battalion but concentrated particularly on Hanneken's Company F, which defended the extreme left flank of the Marine positions on the ridge. A Company F machine gun section under Mitchell Paige killed many of the Japanese attackers, but Japanese fire eventually killed or injured almost all the Marine machine gunners. At 05:00, Oka's 3rd Battalion, 4th Infantry succeeded in scaling the steep slope of the ridge and pushed the surviving members of Company F off of the crest. Responding to the Japanese capture of part of the ridgeline, Major Odell M. Conoley, Hanneken's battalion executive officer quickly gathered a counterattack unit of 17 men, including communications specialists, messmen, a cook, and a bandsman. Conoley's scratch force was joined by elements of Hanneken's Company G, Company C, and a few unwounded survivors from Company F and attacked the Japanese before they could consolidate their positions on top of the ridge. By 06:00, Conoley's force had pushed the Japanese back off of the ridge, effectively ending Oka's attack. The Marines counted 98 Japanese bodies on the ridge and 200 more in the ravine in front of it. 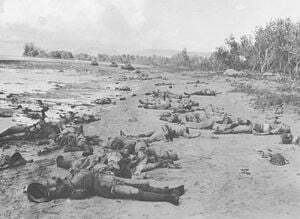 Hanneken's unit suffered 14 killed and 32 wounded. At 08:00 on October 26, Hyakutake called off any further attacks and ordered his forces to retreat. Maruyama's men recovered some of their wounded from near the American lines on the night of October 26 – 27 and began to withdraw back into the deep jungle. 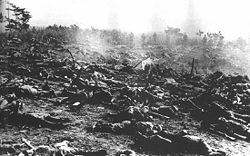 The Americans recovered and buried or burned as quickly as possible the remains of 1500 of Maruyama's men left lying in front of Pullers's and Hall's lines. Said one US Army participant, John E. Stannard, of the scene after the battle, "The carnage of the battlefield was a sight that perhaps only the combat infantryman, who has fought at close quarters, could fully comprehend and look upon without a feeling of horror. One soldier, after a walk among the Japanese dead, said to his comrade: 'My God, what a sight. There's dead (Japanese) stretched from the Corner back along the edge of the jungle for a half a mile.'" Maruyama's left wing survivors were ordered to retreat back to the area west of the Matanikau River while Shoji's right wing was told to head for Koli Point, east of the Lunga perimeter. The left wing soldiers, who had run out of food several days before, began the retreat on October 27. During the retreat, many of the Japanese wounded succumbed to their injuries and were buried along the Maruyama road. One of Maruyama's men, Lieutenant Keijiro Minegishi, noted in his diary, "I never dreamed of retreating over the same mountainous trail through the jungle we crossed with such enthusiasm… we haven't eaten in three days and even walking is difficult. On the up hill my body swayed around unable to walk. I must rest every two meters." Leading elements of the 2nd Division reached the 17th Army headquarters area at Kokumbona, west of the Matanikau on November 4. The same day, Shoji's unit reached Koli Point and made camp. Decimated by battle deaths, combat injuries, malnutrition, and tropical diseases, the 2nd Division was incapable of further offensive action and would fight as a defensive force for the rest of the campaign. Later in November, U.S. forces drove Shoji's soldiers from Koli Point back to the Kokumbuna area, with a battalion-sized Marine patrol attacking and harassing them almost the entire way. Only about 700 of Shoji's original 3000 men ultimately returned to Kokumbuna. At the same time that Hyakutake's troops were attacking the Lunga perimeter, Japanese aircraft carriers and other large warships under the overall direction of Isoroku Yamamoto moved into a position near the southern Solomon Islands. From this location, the Japanese naval forces hoped to engage and decisively defeat any Allied (primarily U.S.) naval forces, especially carrier forces, that responded to Hyakutake's ground offensive. Allied naval carrier forces in the area, now under the command of William Halsey, Jr. who had replaced Ghormley, also hoped to meet the Japanese naval forces in battle. The two opposing carrier forces confronted each other on the morning of October 26, in what became known as the Battle of the Santa Cruz Islands. After an exchange of carrier air attacks, Allied surface ships were forced to retreat from the battle area with the loss of one carrier sunk and another heavily damaged. The participating Japanese carrier forces, however, also retreated because of high aircraft and aircrew losses and significant damage to two carriers. Although an apparent tactical victory for the Japanese in terms of ships sunk and damaged, the loss of many irreplaceable, veteran aircrews by the Japanese provided a long-term strategic advantage for the Allies, whose aircrew losses in the battle were relatively low. Although the Japanese army's attack on the Allied Lunga perimeter was decisively defeated in this battle, the Japanese were not yet ready to give up the struggle for Guadalcanal. The Japanese army and navy made immediate plans to move the rest of the 38th Division to the island, along with the 51st Infantry Division, to try a further offensive against Henderson Field in November 1942. The Japanese again planned to bombard Henderson Field with battleships in order to allow a convoy of transport ships to deliver the 38th's troops and heavy equipment. In contrast, however, to what occurred on October 14, this time the U.S. Navy moved to intercept the battleship forces sent by Yamamoto from Truk to shell the airfield. 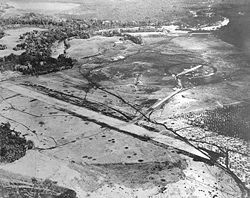 During the ensuing Naval Battle of Guadalcanal from November 13–15, Allied naval and air forces turned back two Japanese attempts to bombard Henderson Field and almost completely destroyed the transport convoy carrying the remainder of the 38th Division. After this failure to deliver significant additional troops to the island, the Japanese commanders finally conceded defeat in the battle for Guadalcanal and evacuated most of their surviving troops by the first week of February, 1943. Building on their success at Guadalcanal and elsewhere, the Allies continued their campaign against Japan, ultimately culminating in Japan's defeat and the end of World War II. ↑ John Miller, Jr. Guadalcanal: The First Offensive - War In The Pacific, United States Army In World War II. (Barnes & Noble, 1995), 143; and Richard Frank. (1990). Guadalcanal: The Definitive Account of the Landmark Battle. (New York: Random House. ISBN 0394588754), 338. Number reflects total Allied forces on Guadalcanal, not necessarily the number directly involved in the battle. 4500 additional American troops defended Tulagi. ↑ Frank O. Hough. (1958) 1989. Pearl Harbor to Guadalcanal. (Washington, DC: USG Printing Office), 323; Miller, 1995, 139. 5,000 were present on the island after the Battle of Edson's Ridge and 15,000 more were delivered between that time and October 17. ↑ 3.0 3.1 Hough, 337. ↑ Richard Frank. 1990. Guadalcanal: The Definitive Account of the Landmark Battle. (New York: Random House. ISBN 0394588754), 364–365. About 200 U.S. troops were wounded. Casualty figures from various official U.S. military records differ somewhat from each other. ↑ Frank, 365. U.S. 1st Marine Division official history estimates 2,200 Japanese were killed but Frank states that that number, "is probably below the actual total." Gordon L. Rottman. 2005. Japanese Army in World War II: The South Pacific and New Guinea, 1942–43. (Oxford and New York: Osprey. ISBN 1841768707), 63, says 3,000 Japanese were killed. ↑ Samuel Eliot Morison. (1958). 2001. The Struggle for Guadalcanal, August 1942 – February 1943, vol. 5 of History of United States Naval Operations in World War II. (reprint Castle Books, ISBN 0785813063), 14–15. ↑ Frank, 141–143, 156–158, 228–246, & 681. ↑ Gordon L. Rottman. 2004. US Marine Corps Pacific Theatre of Operations 1941–43. (Oxford: Osprey. ISBN 184176518X), 71. ↑ Griffith, 156; and Smith, 198–200. ↑ Smith, 204; and Frank, 270. ↑ John L. Zimmerman. The Guadalcanal Campaign, 96–101. ; Smith, 204–215; Frank, 269–290; Griffith, 169–176; and Hough, 318–322. The 2nd Infantry was called Sendai because most of its soldiers were from Miyagi Prefecture. ↑ Dull, 226–230; Frank, 289–330; Hough, 322; and Rottman, 2005, 61. The Japanese troops delivered to Guadalcanal during this time comprised the entire 2nd (Sendai) Infantry Division, two battalions from the 38th Infantry Division, and various artillery, tank, engineer, and other support units. ↑ Frank, 315–320, 171–175; and Hough, 326–327. ↑ Hough, 328–329; Frank, 319–321. ↑ Henry I. Shaw. First Offensive. The Marine Campaign for Guadalcanal. (U.S. Marine Corps. 1992), 34, and Rottman, 2005, 63. ↑ Rottman, 2005, 61; Frank, 328–340; Hough, 329–330. Kawaguchi's forces also included what remained of the 3rd Battalion, 124th Infantry Regiment which was originally part of the 35th Infantry Brigade commanded by Kawaguchi during the Battle of Edson's Ridge. ↑ Griffith, 186–190; Frank, 343–344; Hough, 328–329;, Miller, Guadalcanal: The First Offensive, pp. 144–46. ↑ Miller, 155; Hough, 330; Rottman, 2005, 62; Griffith, 187–188; Stanley Coleman Jersey. 2008. Hell's Islands: The Untold Story of Guadalcanal. (College Station, TX: Texas A&M University Press. ISBN 1585446165), 267, 274. Only one Japanese gun, a 75 mm mountain gun, actually reached a firing position to support the attack and only fired 20 rounds. Hyakutake sent a member of his staff, Colonel Masanobu Tsuji to monitor the 2nd Division's progress along the trail and to report to him on whether the attack could begin on October 22 as scheduled. Masanobu Tsuji has been identified by some historians as the most likely culprit behind the Bataan Death March that had begun April 10, 1942. ↑ Hough, 330–332; Frank, 342–345; Griffith, 193; Jersey, 283. ↑ Rottman, 2005, 62; Frank, 342–344; Hough, 330–332; Miller, 1995, 159–160. ↑ Griffith, 193; Frank, 346–348; Rottman, 2005, 62. ↑ Hough, 332–333; Frank, 349–350; Rottman, 2005, 62–63; Griffith, 195–196. Twelve tanks were originally landed by the Japanese. Two were damaged during the landing and one was later destroyed during a feint at the mouth of the Matanikau. Oscar E. Gilbert 2001. Marine Tank Battles in the Pacific. (New York: Da Capo. ISBN 1580970508), 48–49. ↑ Gilbert, 49; Miller, 1995, 157–158; Frank, 349–350; Griffith, 195–196. The Marines lost two killed in the action. Nakaguma's infantry losses aren't recorded but were, according to Frank "unquestionably severe." Griffith says that 600 of Nakaguma's men were killed. Only 17 of the 44 members of the 1st Independent Tank Company survived the battle. ↑ Griffith, 196; Frank, 351–352; Hough, 333. ↑ Shaw, 37; Frank, 348–352; Hough, 333. ↑ 32.0 32.1 Frank, 353–354. ↑ Frank, 354–355; Hough, 334. ↑ Hough, 334–335; and Frank, 355. ↑ Griffith, 198; Frank, 355–356; Hough, 334–335. ↑ Hough, 334–335; Frank, 356. ↑ Miller, 1969/1981, 145–146; Frank, 357; Griffith, 201–202. ↑ Griffith, 201–202; Frank, 357–359; Miller, 1969/1981, 147. ↑ Frank, 360–361; Griffith, 201–202; Miller, 1969/1981, 147–149. ↑ Lundstrom, John B. (1994) 2005. (New edition). First Team And the Guadalcanal Campaign: Naval Fighter Combat from August to November 1942. (Naval Institute Press. ISBN 1591144728), 343–352; Frank, 359–361; Hough, 335–336. The aircraft from Hiyō were based at Rabaul and Buin. The reconnaissance aircraft was from the Japanese Army Air Force's 76th Independent Air Squadron. ↑ 45.0 45.1 Frank, 361–362. ↑ 49.0 49.1 Frank, 363–364. ↑ 50.0 50.1 Griffith, 204. ↑ Jersey, 292; Frank, 364. ↑ Frank, 418, 424, and 553. ↑ Morison, 199–207; Frank, 368–378; Dull, 235–237. Admiral Chester Nimitz, Allied Commander in Chief of Pacific Forces, replaced Ghormley with Halsey on October 18. ↑ Dull, 237–244; Morison, 207–224. ↑ Rottman, 2005, 63–64; Frank, 404–406. ↑ Frank, 428–492; Rottman, 2005, 64; Dull, 245–269. Cook, Charles Orson. (1968) 1992. The Battle of Cape Esperance: Encounter at Guadalcanal.’’ US Naval Institute Press. ISBN 1557501262. Dull, Paul S. 1978. A Battle History of the Imperial Japanese Navy, 1941–1945. Naval Institute Press. ISBN 0870210971. Frank, Richard 1990. Guadalcanal: The Definitive Account of the Landmark Battle. New York: Random House. ISBN 0394588754. Gilbert, Oscar E. 2001. Marine Tank Battles in the Pacific. New York: Da Capo. ISBN 1580970508. Griffith, Samuel B. (1963). 2000. The Battle for Guadalcanal. Champaign, Illinois, USA: University of Illinois Press. ISBN 0252068912. Hough, Frank O. Pearl Harbor to Guadalcanal. History of U. S. Marine Corps Operations in World War II. Volume 1. Jersey, Stanley Coleman 2008. Hell's Islands: The Untold Story of Guadalcanal. College Station, TX: Texas A&M University Press. ISBN 1585446165. Lundstrom, John B. (1994) 2005. (New edition). First Team And the Guadalcanal Campaign: Naval Fighter Combat from August to November 1942. Naval Institute Press. ISBN 1591144728. Miller, John, Jr. Guadalcanal - First Offensive - War In The Pacific, United States Army In World War II. Barnes & Noble, 1995. Miller, Thomas G., Jr. (1969). 1981. The Cactus Air Force: The Story of the Handful of Fliers Who Saved Guadalcanal. Admiral Nimitz Foundation. Harper Row. ISBN 0934841179. Morison, Samuel Eliot (1958). 2001. The Struggle for Guadalcanal, August 1942 – February 1943, vol. 5 of History of United States Naval Operations in World War II. Boston: Little, Brown and Company. reprint Castle Books, 2001, ISBN 0785813063. Proser, Jim, and Jerry Cutter 2004. "I'm Staying with My Boys…" The Heroic Life of Sgt. John Basilone, USMC. Lightbearer Communications Company. ISBN 0975546104. Rottman, Gordon L., and Dr. Duncan Anderson, (consultant editor), 2004. US Marine Corps Pacific Theatre of Operations 1941–43. Oxford: Osprey. ISBN 184176518X. Rottman, Gordon L., and Dr. Duncan Anderson, (consultant editor) 2005. Japanese Army in World War II: The South Pacific and New Guinea, 1942–43. Oxford and New York: Osprey. ISBN 1841768707. Shaw, Henry I. FIRST OFFENSIVE: THE MARINE CAMPAIGN FOR GUADALCANAL.’’ U.S. Marine Corps. 1992. Smith, Michael T. 2000. Bloody Ridge: The Battle That Saved Guadalcanal. New York: Pocket. ISBN 0743463218. Tregaskis, Richard (1943). Guadalcanal Diary. New York, USA: Random House. OCLC: 397106. Twining, Merrill B. 1996. No Bended Knee: The Battle for Guadalcanal. Novato, CA, USA: Presidio Press. ISBN 0891418261. Anderson, Charles R. 1993, GUADALCANAL (brochure) U.S. GOVERNMENT PRINTING OFFICE. Chen, C. Peter, 2004–2006, Guadalcanal Campaign. World War II Database. Flahavin, Peter, 2004, Guadalcanal Battle Sites, 1942–2004. – Web site with many pictures of Guadalcanal battle sites from 1942 and how they look now. Hough, Frank O., Ludwig, Verle E., and Shaw, Henry I., Jr. Pearl Harbor to Guadalcanal. History of U.S. Marine Corps Operations in World War II. Miller, John Jr., 1949, Guadalcanal: The First Offensive. United States Army in World War II. Shaw, Henry I., 1992, First Offensive: The Marine Campaign For Guadalcanal. Marines in World War II Commemorative Series. Zimmerman, John L., 1949, The Guadalcanal Campaign. Marines in World War II Historical Monograph. History of "Battle for Henderson Field"
This page was last modified on 16 May 2016, at 15:57.